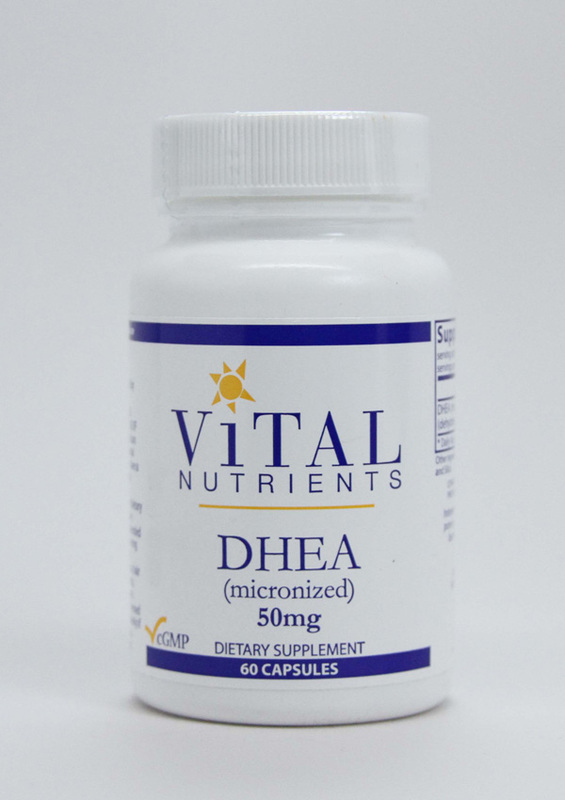 DHEA is a hormone produced by the adrenal glands. It is the most abundant steroid hormone in the body. Most abundant adrenal steroid hormone in the body. DHEA is a hormone produced by the adrenal glands and is a precursor to androgens. DHEA, along with other adrenal hormones, affects metabolism, immune response, energy levels, and estrogen and testosterone levels. Use only as directed by your healthcare professional. CONTAINS NO COATINGS, BINDERS, YEAST, WHEAT, GLUTEN, MILK/ DAIRY, CORN PROTEIN, SOY PROTEIN, EGGS, SUGAR, HYDROGENATED OIL, ARTIFICIAL COLORING, ARTIFICIAL FLAVORING, OR PRESERVATIVES. DHEA is SAFE for most people. It can cause some side effects including acne, hair loss, stomach upset, and high blood pressure. Some women can have changes in menstrual cycle, facial hair growth, and rarely a deeper voice after taking DHEA (Dr. Adrian has never seen this). DHEA is POSSIBLY UNSAFE when used in larger amounts and long-term. Do not use DHEA in doses higher than recommended. Using higher doses or long-term use of DHEA can increase the chance of side effects. Pregnancy and breast-feeding: DHEA is POSSIBLY UNSAFE when taken by mouth during pregnancy or breast-feeding. It can cause higher than normal levels of a male hormone called androgen. This might be harmful to the baby. Don't use DHEA if you are pregnant or breast-feeding. Note:DHEA can dramatically increase fertility for infertile women. Hormone-sensitive conditions such as breast cancer, uterine cancer, ovarian cancer, endometriosis, or uterine fibroids: DHEA is a hormone that can affect how estrogen works in the body. If you have any condition that might be made worse by exposure to estrogen, don't use DHEA. (Dr. Adrian has never measured an appreciable increase in estrogen from DHEA). Diabetes: DHEA can affect how insulin works in the body. If you have diabetes, monitor your blood sugar carefully if you are taking DHEA. You will likely need less insulin. Depression and mood disorders: There is some concern that patients with a history of depression and bipolar disorder might have some mental side effects if they use DHEA. DHEA can cause mania (excitability and impulsiveness), irritability, and sexual inappropriateness in people with mood disorders. If you have a mood disorder, be sure to discuss DHEA with your healthcare provider before you start taking it. Also, pay attention to any changes in how you feel. DHEA for many improves their mood and libido. Polycystic ovary syndrome (PCOS): Taking DHEA might make this condition worse. Don't use DHEA if you have PCOS. This warning is based upon the fact that high DHEA-S is a marker for PCOS. However, PCOS is caused partly by insulin resistance, a condition that DHEA helps.